With the New Year upon us Shannon is already 15 weeks pregnant which means she is already almost half way to having a baby! As you can see a bump is starting to show and supposedly there will be a lot more growth in the next few weeks. We even went to our first pre-natal class tonight which was quite interesting. Since we really don't know anyone else that has been or is pregnant it was nice to meet other people our age going through the same thing. The classes are offered by the city and go on for the next five weeks. 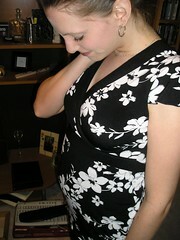 They cover many aspects of having a baby including pregancy, labour, parenting and baby's health. Once we go to a few more classes I will provide an update on how effective I think they are. Posted by Anthony at 1/30/2007 11:38:00 p.m.
My husband and I have a baby ourselves now -- Madeleine was born in May. You guys are in for the time of your lives. A baby is life changing in the best possible way. I can't imagine life now without my daughter!